Home / Sentai / Lupinranger and Patoranger: 1st quarter toys revealed. 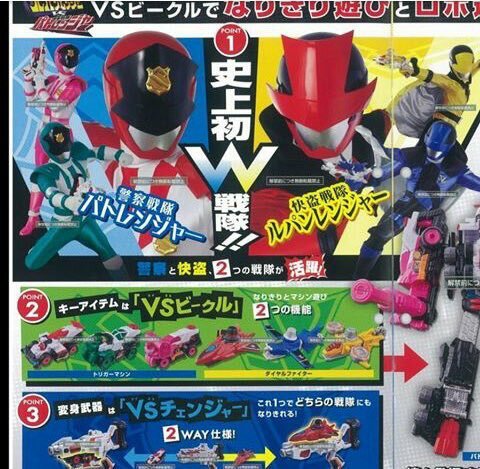 Lupinranger and Patoranger: 1st quarter toys revealed. Recently, the first toys for Lupinranger and Patoranger were revealed. In this update, we have a description for each of the toys that will be available in the first quarter. Update Dec 8th: We can now reveal the first catalogue image from Patoranger/Lupinranger. The first toy is the “Double Henshin Juu”. This is the transformation device for the two teams and will use the new gimmick/zords, the Vs Vehicles. It will come with either LupinRed or PatranIchigo’s Vs Vehicles. It will recognise all the Vs Vehicles. For those who only like to collect the gimmicks, the Vs Vehicles will also be able to be purchased separately. The Vehicles for LupinBlue, LupinYellow, PatranNigo and PatranSango will be available for purchase too. Each of the Vehicles will be able to switch modes. And, of course, there will be figures for all 6 of the Rangers. Both teams will have their own weapon. The Lupinrangers use the Itadaki Kaito Lupinsword (That can transform from a sword to a grabber) and the Kakisei Keibo Megabo (That can transform from a baton to a megaphone). Next is the VSV Double Henkei Goodstriker. It is a big Vs Vehicle that can be combined with other Vs Vehicles to make a Mecha for each team. It becomes LupinKaiser when combined with Lupinranger’s Vs Vehicles and it becomes PatoKaiser when combined with Patoranger’s Vs Vehicles. It will also come in a set with either team’s Vehicles. Later on, the teams will get more Vs Vehicles. Lupinranger will get Cyclone Dial Fighter and Patoranger will get Trigger Machine Biker. What do you think of these new toys? Let us know in the comments!